Our Moose Supply 5 Mil Multi-Purpose Poly Tarp Covers are a standard grade, ultra-versatile tarp that is great for just about any job you throw at them. Whether it's protecting your possessions from the elements, creating a temporary camping shelter, for use as a ground cover on concrete, a surface protector when painting or as a car/truck/boat/motorcycle cover ... there really just isn't any task that these tarps are not equipped to handle. They are constructed with a strong 8 x 8 mesh weave, polypropylene fabric with a 5 mil thickness and has rust-resistant grommets positioned approximately every 3 feet for easy tie downs and staking. Designed with heat-sealed seams and rope reinforce hems, these features provide added durability and extended longevity to these poly tarps. Our polypropylene fabric is coated to resist mold, mildew, rot, acid, tears and water. They also feature arctic flexibility, allowing them to be utilized for jobs even in the coldest of conditions. With a blue color on one side and silver on the other, these tarps are reversible. These Moose Supply poly tarps are ideal for a wide range of uses such as ground protection for inflatable bounce houses, obstacle courses, and wet/dry slides. Place underneath your inflatable unit to safeguard from wear and tear caused by direct placement on top of concrete and blacktop or to simply keep them clean from grass and dirt. 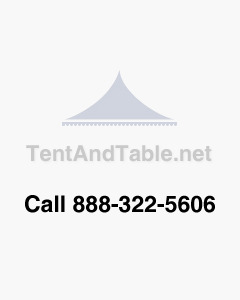 This style of a tarp is also commonly used on construction sites, on roofing and landscaping jobs, as well as temporary tarp covers for outdoor activities. SIZE DISCLAIMER: All of the tarp sizes are "Cut Sizes", the industry standard. The "Finished Size" is usually 3" shorter on each side. For example, a 10' x 20' tarp has a Finished Size of 9' 6" x 19' 6." 21" x 17" x 7.5"